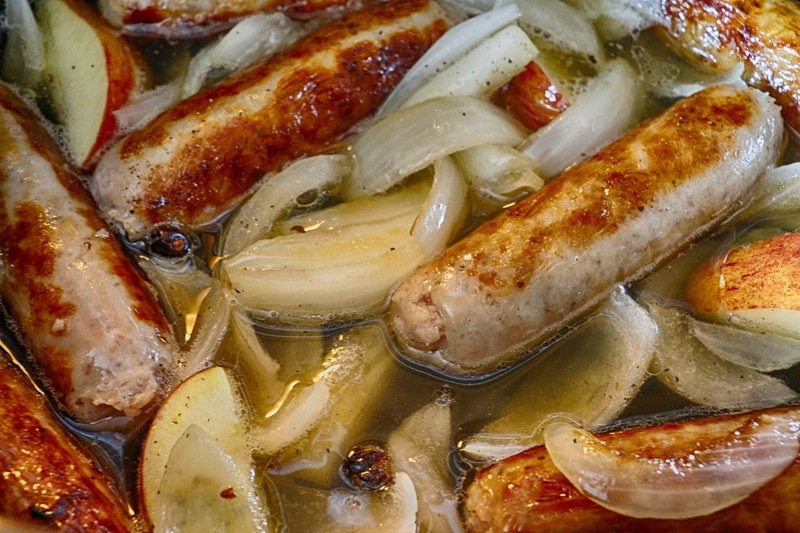 Yet another slow cooker sausage recipe? Yes, I find you can never have too many of them. Sausages are good value especially when you get them reduced like I got this packet. I also found a stray can of cider reduced in the supermarket a while back. Neither myself or Mr JibberJabber are cider drinkers but I know it makes for a great pairing for any pork dishes. The alcohol all cooks off leaving behind a delicious richness which works so well in a sauce. In the fruit bowl there was also a couple of apples that looked past their best but perfectly fine for cooking with. So this is made up of reduced items and food that may have well been thrown out if I hadn't rescued them. Sounds like the perfect meal to me! 2. Brown the sausages in the frying pan. Add some oil if required. 3. Remove with a slotted spoon/fish slice and put into the slow cooker. 4. In the remaining oil fry the onion until softened. 5. Transfer the onion to the slow cooker. 6. Slice and core one of the apples and add to the sausages and onions. 7. Pour the cider over the top. Season as required. 8. Cook on LOW for 6-8 hours or HIGH for 4-6 hours. 9. 30 minutes before serving slice the other apple and add to the casserole. 10. Mix the cornflour with 4 tbsp (60ml) of water and stir in.